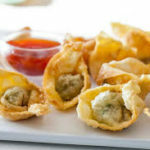 Place by tsp full on won ton skins and fold into triangle. Cook in hot cooking oil unti golden brown. Combine everything but green peppers. Bring to boil. Simmer 20 minutes over low flame. Add green peppers and serve.